It started with a simple question asked by high school teacher Paul Ritter of his ecology class: What does one do with medicines when you no longer need them? This question has lead to a lot of research by students, a movie at the Sundance Festival, a new song, a new mascot–Pill Bottle Phil–but most importantly, it has led to a program that is now the model for collection programs across the country. The Prescription Pill and Drug Disposal (P2D2) Program educates the public about the harm done to the environment due to the current prescription and non-prescription drug disposal practices and provides alternative disposal solutions that ensure the quality of our water for future generations. Founders of this successful program, Ritter and Eric Bohm, are teaming up with IISG educators Robin Goettel and Terri Hallesy to mentor six science teachers who wish to incorporate the P2D2 curriculum in their schools and communities in Indiana. P2D2 is a collaborative effort between local pharmacies, officials, and high school teachers and students. To learn more about P2D2, visit the web site. 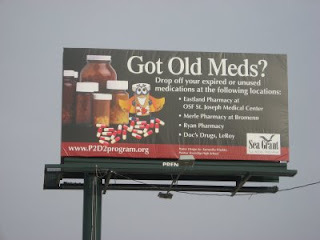 Above is one of two P2D2 billboards in Bloomington that publicize the P2D2 program and highlight where people can drop off their expired or unused medications. IISG helped sponsor this billboard.